Kohlrabi. Just the name is fun let alone the back story . Apparently considered a “new” vegetable (as in really only discovered 400-500 years ago or so….what a yungin’), Texas A&M’s horticulture site informs us that Kohlrabi and Brussels sprouts are “the only common vegetables of Northern European origin.” Kohlrabi is a brassica…a relative of cabbages, kales, broccolis and the like…whose name is German. Kohl = cabbage and Rabi = turnip. So, literally it is the “cabbage turnip.” It is a cool season crop that is easy to grow. It can be purple or white (light green) skinned. This vegetable is commonly consumed in India, too. 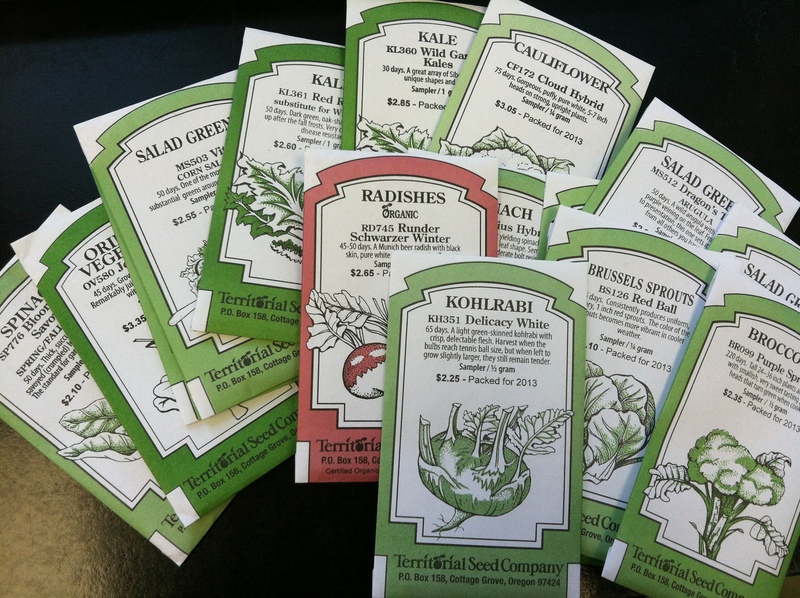 As with most brassica vegetables, Kohlrabi is good for you. It is high in vitamin C and fiber, as well as being a good source of other vitamins and minerals (vitamin B6, thiamin, folate, potassium, magnesium, copper and manganese to name a few). It also has a low estimated glycemic load (i.e. 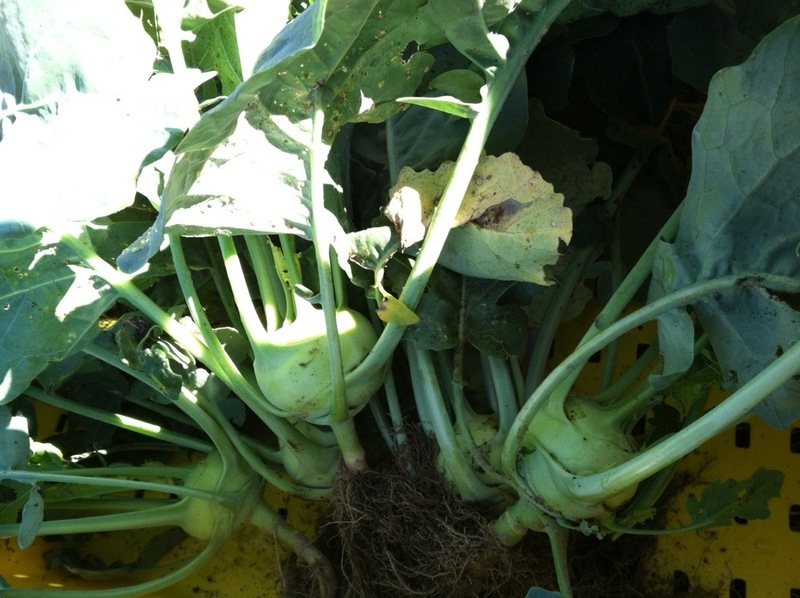 low likelihood that a serving of kohlrabi will affect blood glucose levels). But to this day, this veggie lacks popularity in the US of A. I, however, find it to be an intriguing vegetable. Crunchy like an apple…the flavor is mild and sweet…almost like the stalks of broccoli (which I eat along with the florets…why toss that edible goodness? ). That said, this season is my first for growing it. 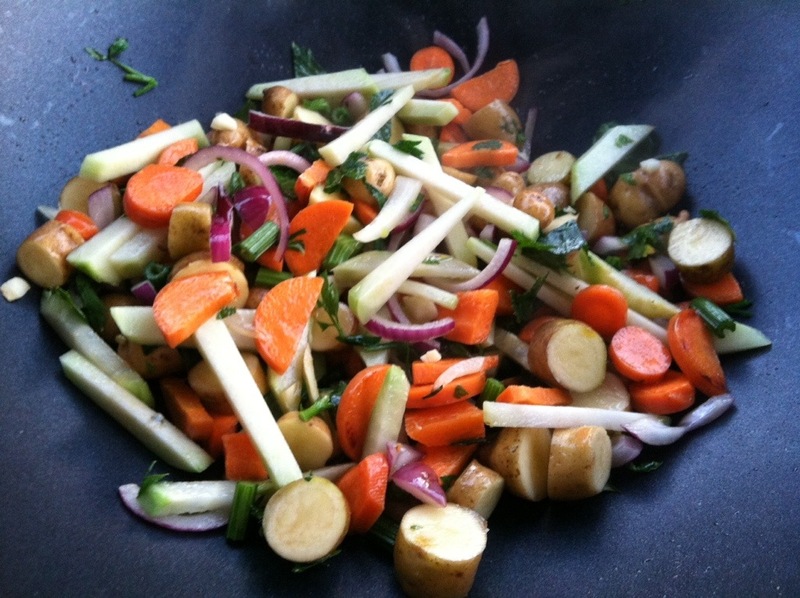 I have been enjoying it raw as a snack or cut up in salads. 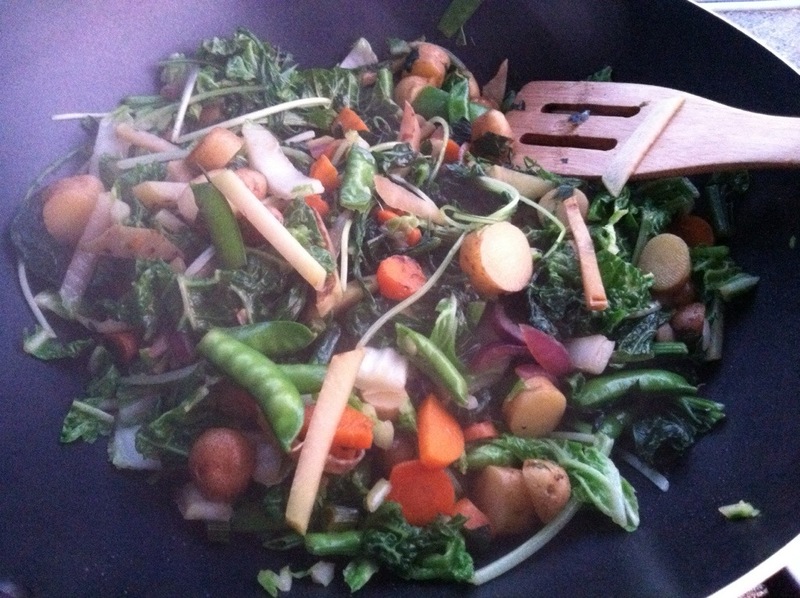 I’ve tossed it into stir fry or in veggie sautes. But I have no experience cooking it any other way. My question to those of you following this blog or who happen across us in cyberspace is…do you have any other cooking suggestions? Oh sure, I could Google this and that, but I thought I would pose the question to fellow foodies and cooks out there to best learn what to try. To get the down and dirty scoop on things. Do you cook it as a main soup ingredient? A mash? Roasted? Grilled? 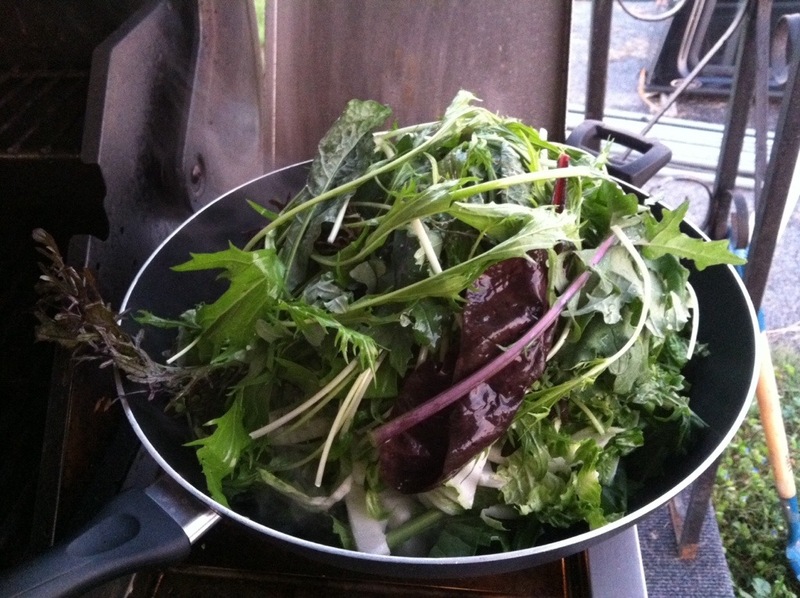 What have you tried with this unusual vegetable? With what seasonings? How do you highlight it? I have a few left that I would like to prepare spectacularly…help me out! Thanks, as always, for following us and for your commentary. 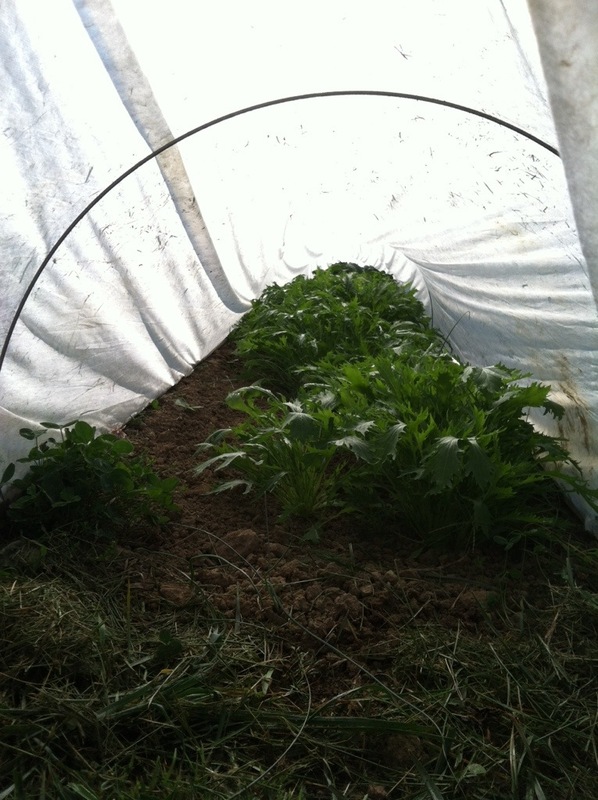 So strange to be working in the garden, harvesting and processing produce….but NOT go to the market today. As we continue to cheer on our fall crops and cleanup from our summer crops, several plans are running through our minds about next season and how to make things better. 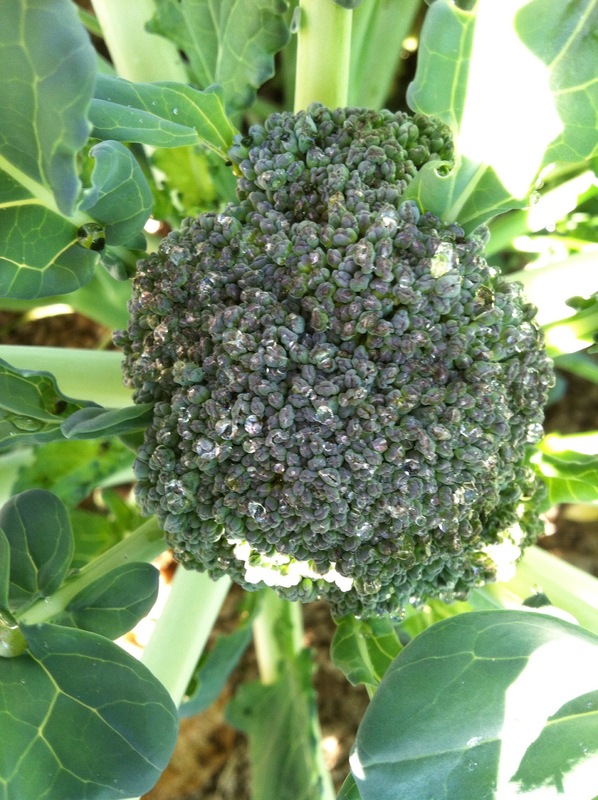 Still, it is fun to celebrate the small things that are happening now….broccoli coming in, our first kohlrabi harvest, and Asian mustards plus other greens thriving under row cover.